Shop. Dine. Stay. Play. Cedar Springs. Brunch lacks rules. It’s neither breakfast nor lunch. It’s a planned event with a buffet for Mother’s Day or a last second Sunday morning decision after a night out. Get up early or hit the snooze button for hours—the fluffy eggs and sugar-dusted carbs will be there either way. The café-style eatery on the corner of Cedar Springs Road and Throckmorton Street opened less than two years ago but has fast become a neighborhood staple. The covered patio, adorned in quaint two and four-top tables, is bustling every Sunday with energetic folks reminiscing about last night’s festivities. Offerings include a hodgepodge of classic American staples and European-inspired comfort food. 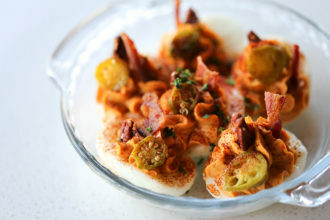 The brunch menu boasts some of the best deviled eggs in town: whipped yolk and pimento cheese topped with pickled okra, crispy ham, spicy pecans, and a dusting of paprika. The seafood omelet is crammed with shrimp, crawfish, bell peppers, and onion, and gets topped with seafood and mushroom pontchartrain sauce. You’ll be daydreaming of the Big Easy. Service can be dubious at times, but the carafes of fizzy mimosas make up for it. Saturday and Sunday from 7 a.m. until 3 p.m. Thanks to D Magazine. You can read the full article here. We are really looking forward to the exciting changes coming to the strip! Cedar Springs Road is home to a diverse array of retail, nightlife, restaurants, accommodations and services. © 2019 Cedar Springs Merchant Association. All Rights Reserved. Designed and managed by Bartech Services.